Seriously, Do We Get Any Real Benefit from Having Quad HD Displays on Smartphones? In a post back in February, we touched on the issue of how senseless it is to have ultra high resolutions in smartphone displays. A 442 dpi pixel density looks more-than-sharp enough. However, it seems the 1080p displays on 5” to 5.5” smartphones these days are no longer enough that manufacturers are again trying to “upgrade” to higher resolutions —QHD at that! That’s four times the HD or 720p resolution. 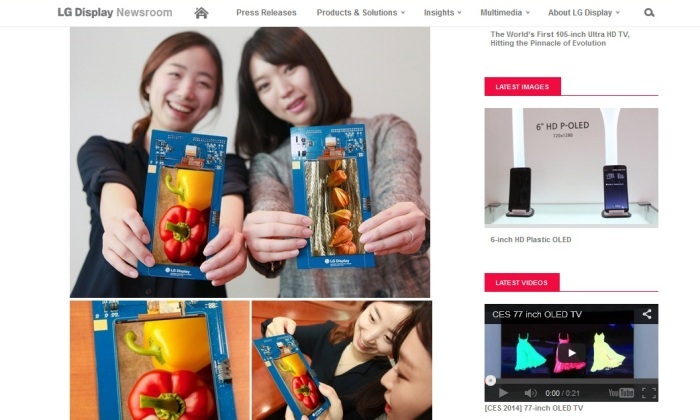 LG appears to be the pioneer of high resolution displays for mobile devices. It claims to have introduced the first full HD smartphone display panel in 2012. 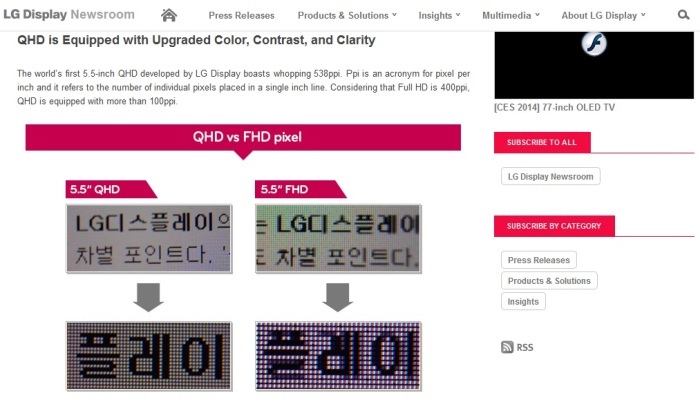 In August 2013, it announced the first QHD smartphone display panel, which can be expected in the yet to be announced LG G3, the company’s flagship smartphone for 2014. Obviously, all of these supposed advantages are arguable. The perceived increase in clarity and sharpness of images are likely very marginal, if they can even be noticed by the unaided human eye. Display comparisons even require magnifications to point out the differences. In the case of contrast, it’s rather unintelligent to claim that contrast is improved by the addition of more pixels. For color vividness, again, the pixel count has nothing to do with it. Sony, for instance, was able to achieve better color vibrancy with an increased color gamut in their Xperia Z2 handset by using their proprietary Triluminos technology and Live Color LED backlighting. The increased number of pixels is simply not a factor. Moreover, the supposed ability to view desktop versions of web pages without distortion is already achieved by the use of 1080p displays. Most websites are not even optimized for FHD resolution viewing. Thankfully, at least one Chinese smartphone maker does not seem inclined to pursue the mobile device display resolution wars. Huawei Consumer Business Group CEO Richard Yu, in an interview with Techradar, said that he does not think QHD displays on mobile devices are needed, pointing out that the human eyes are unable or at least very hardly capable of spotting the differences between FHD and QHD displays. 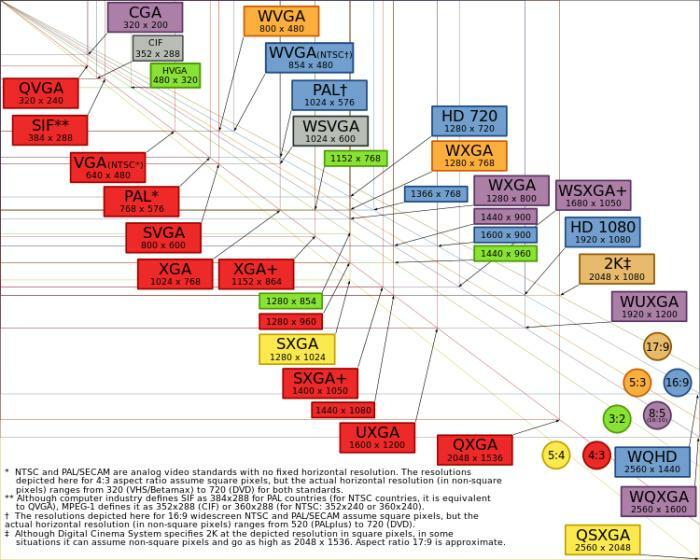 Higher Cost – This is one of the major drawbacks of having quad HD displays on mobile devices. Of course, coming up with an extraordinarily high resolution involves research and development efforts. The R&D costs can’t be disregarded. Additionally, more materials and a new manufacturing process will be needed for the production. All of these entail additional costs. Higher Power Consumption – As what can be observed in the battery performance of devices with higher display resolutions, there is definitely going to be an increase in power consumption. Power consumption for the backlight may not change but there will be increases in the amount of work the CPU and GPU will have to deal with. Higher Price – As the cost of producing the high resolution display panel increases, the selling price expectedly increases as well. Some companies may try to lower their profits on every unit sold to maintain their regular price levels but such a case is rather rare. LG, for instance, is widely known for its relatively low prices but with the introduction of their QHD display, they may have some reason to demand a higher-than-their-usual price. So, what really is the benefit of having QHD displays on smartphones? Apparently, there’s nothing much other than the improved sharpness that will not really be that noticeable for most mobile device users. Under 5.5” or 5”, the typical display sizes of top of the line smartphones, it can be said that there’s almost no point of trying to force a QHD resolution. This higher resolution may offer tangible imaging benefits for bigger displays (for tablets or phablets) but not on smartphones. Even if newer technologies make it possible to produce high resolution small mobile displays with better efficiency, it would have been better if the efficiency is allotted to more worthwhile applications.